As part of the preparations leading up to the campaign, all the players were asked to provide a "scenic" image presenting their main force. Lacking in game board and scenery (tiny apartment is tiny) I had to make the best of it with photoshop. Spent quite some time highlighting and shaddowing the Marauder as is dominates the image. Not sure if I went overboard with the engine trails, but this is how I imagine they would look like in action. Incredible powerful engines spewing out ashes and death as they roam the skies. 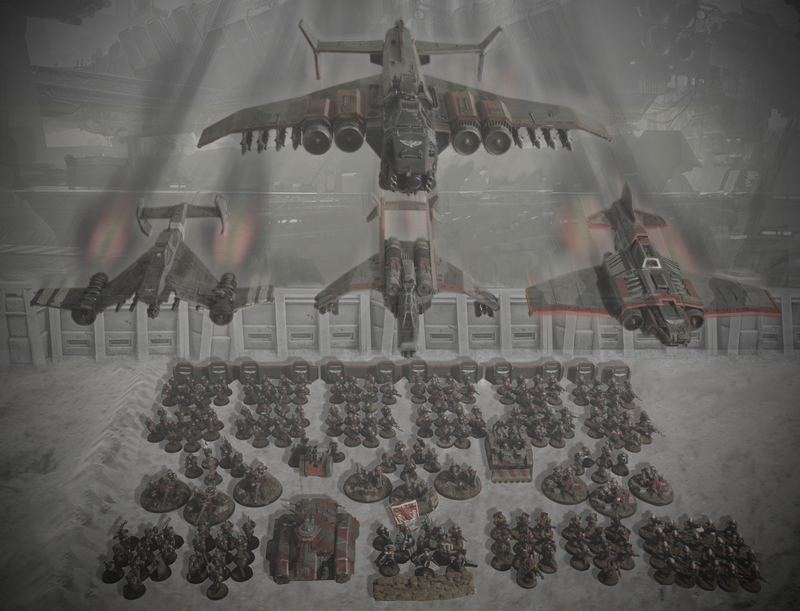 Picture taken during the parade celebrating the arrival of the Astra Militarum at Nolan XVII.Amidst the thick morning mist, about half the 7th company is present marching through the street accompanied by close formation flybys of the 1305th tactical wing. About 200 soldier are taking part in the parade. Behind the scenes: Temporary makeshift photo studio.